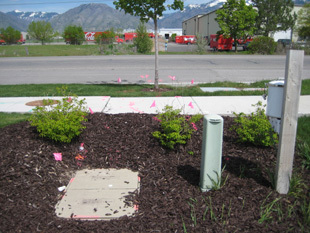 The SUE Solution’s team successfully completed the utility research, mapping, and inventory of this 3.5 mile corridor in Logan, Utah. This phase is the 2nd of the original roadway project completed in 2008. The general scope of the planned reconstruction project includes widening and reconstruction of much of the SR-252 corridor (10th West). SUE Solutions established a program that focused on areas where utilities have been newly installed or relocated since the completion of the original SUE efforts in 2008. SUE Solutions Scope of Work included Quality Level ‘B’ (horizontal) locating, Quality Level ‘A’ (vertical) potholing activities, and the survey of newly installed and relocated power poles as installed by Logan City. Upon completion of the Level ‘B’ designating, approximately 11,400 feet of utilities were designated throughout the project corridor. In addition to this number, an additional 1,900 feet of new overhead power was also located, surveyed and mapped, bringing the total utility footage mapped and located to approximately 13,300 feet. Regarding the efforts placed on the Quality Level ‘A’ locating; seven (7) test holes were performed throughout the project corridor, gathering crucial utility data such as depth, size, and material. 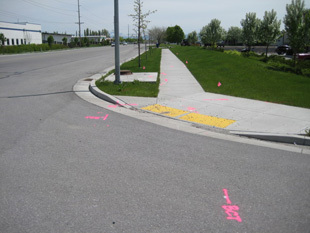 A comprehensive final SUE report was produced as a deliverable which contained inclusive utility (QL-B) mapping, photographic documentation, informational data sheets for the sewer and storm drain systems, survey data, test hole data sheets, and Utility Owners existing mapping.